Drugs can affect the cell cycle in different ways and naturally many cancer drugs target the cell cycle. Different cell cycle inhibitors have different mode of actions to slow or stop cell cycle progression . The cell cycle can be affected at different stages, decreasing the rate of cell divisions and the number of cells in mitosis. HoloMonititor has successfully been used to monitor drug-induced influences on the cell cycle in cultured cells*. The cell cycle-correlated morphological changes of optical cell volume and optical maximum thickness, as determined by HoloMonitor. Based on data from Falck Miniotis et al. (2014), Digital holographic microscopy for non-invasive monitoring of cell cycle arrest in L929 cells, PLOS One 9:1-6. The video shows multiple L929 cells divisions. Note how cells interact with neighboring cells before they divide. Assess cell cycle duration time. Determine drug induced changes in morphology. Detect drug effects on cell cycle phase distribution*. When preferred, further analyses can be undertaken for details on e.g. cell proliferation and cell motility. 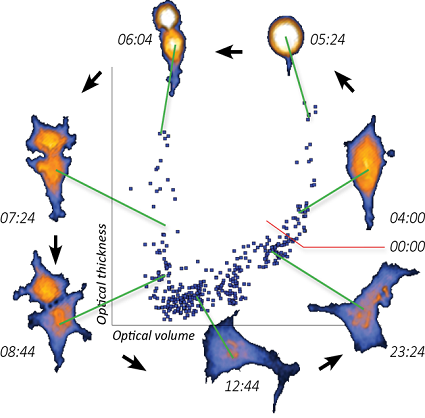 Optical volume versus time for three dividing cells (red, blue and green).